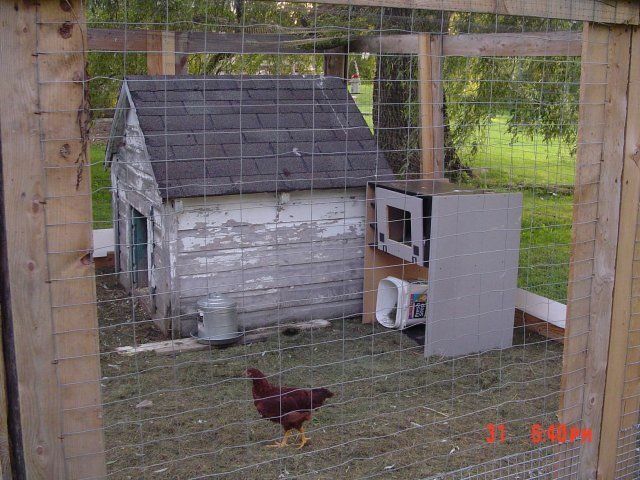 Here is a picture of my dog house converted into a coop. It too is heavier than 25 lbs....probably more like 100...but it is SOLID. It was left on the property when we bought it....been sitting in the same place for 4 years...til we decided to raise chickens earlier this spring. I would like to put a nest box on the side too...but for now, I built an unattached nesting box. married, father to 3 kids, 1 choc lab, 4 cats, 1 guinea pig, 1 beta fish, 4 Barred Rocks (2 roos, 2 hens), 5 RIRs, 4 Phoenix (1 roo, 3 hens), 3 BuffBr. Cochin Banties, 2 Silver Spangled Hamburgs, 2 Americaunas, and 2 rabbits.